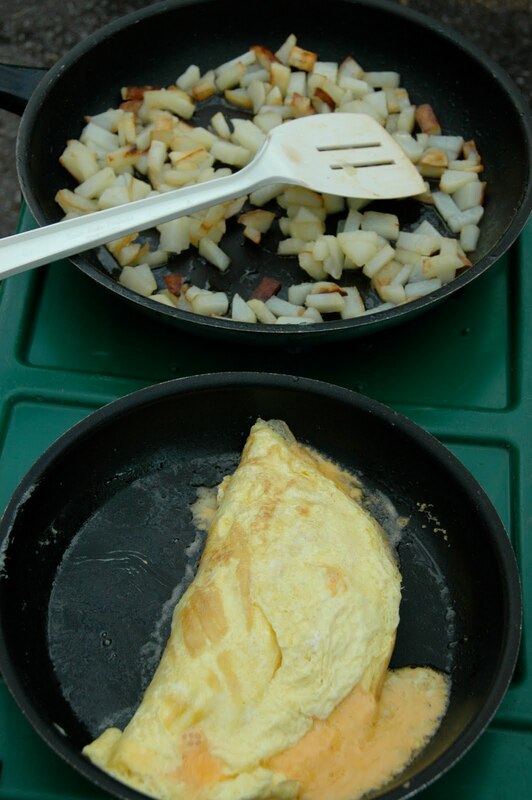 Nothing beats good homecooking on a camping trip. If its not a camping trip, we usually indulge in the local fare. We don't take any shortcuts. We like to eat. 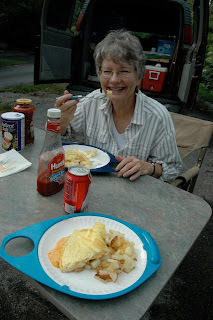 And we usually eat the same type of meals on our camping trips as we do at home. Why not? Breakfast, especially if grandkids are around, usually consists of bacon or sausage, eggs cooked one way or the other, pancakes and toast. Its rare that I eat toast and jelly at home with my breakfast meal, but its a given camping. I always award myself by picking up a jar of orange marmalade. And there is always coffee for me and tea for Linda. Lunch is usually sandwiches, cheese, apples and oranges and sometimes chips. Linda and I have found that chips don't agree with us so we try to stay away from them most of the time. Supper runs the normal gamet of hotdogs and hamburgers, grilled porkchops or steaks, chili, spaghetti and sometimes omelets and hash browns. Again, when grandkids are around, they just love macaroni and cheese. We always take a lot of it with us. And there, of course, is always popcorn and s'mores. Over the course of our many years camping, we usually stick to the above mentioned items. In the past, we would cook a number of meal entres up in advance, but lately on our jaunt to the Great Smoky Mountains, we just stop at the Walmart Supercenter in Clayton, GA., that is within a 100 miles of our destination and load up on what we need. We always keep our campstove and some cooking equipment in our van. There's nothing like being out and about and finding a pretty picnic area in which to eat, or either a nice parking space by a river or at the top of a mountain.